Garuda Wisnu Kencana Cultural Park or GWK Bali offers a beautiful art work that reflects the heritage values of Indonesia local culture. On August 2013 (after 16 years since laying the first stone in June 1997), the project was reworked to finalize the intact statue of GWK Bali. Visitors can enjoy the adventure at GWK Bali. Walking down the beautiful monument (Vishnu and Garuda statue), Kura - Kura Plaza, Lotus Pond, Indraloka Garden with direct view to the Jimbaran area, and a series of classical Balinese dance attraction at GWK Cultural Park. 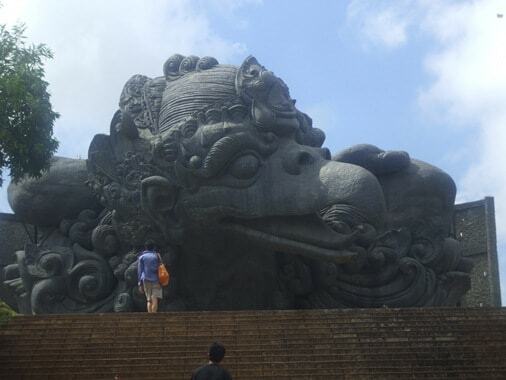 Let's take a closer look to the GWK Cultural Park Bali! GWK is located in Ungasan Village, in the District of Kuta Selatan, Badung Regency Bali. Visitor can get the location directly from Ngurah Rai International Airport just about 11 Kilometers (about 25 minutes). GWK Bali location is close to another tourist attraction such as Uluwatu Temple, Padang Padang Beach, Dream Land Beach, Pandawa Beach, Nusa Dua Beach, and Jimbaran Beach. Situated in Kuta Selatan area, GWK area is influenced by "Moderate Climate" or D type climate (based on Schmidt-Ferguson climate classification maps). Moderate Climate have a humid season starts from November until April. Dry season runs from April to October. The month of November becomes the turning point to rainy season. The district of Kuta Selatan has high rainfall on the month of December, January, and February. Average temperature range from 22.8 - 32.9 degrees Celsius. GWK Bali is equipped with amenities include Lotus Pond, Vishnu Plaza, Amphitheater, Street Theater, Bali Restaurant Window, New Home Restaurant and shops souvenirs. Visitors of all ages can enjoy the adventure at GWK Bali. Walking down the beautiful monument (Vishnu and Garuda statue), Kura - Kura plaza, Indraloka Garden with direct view to the Jimbaran area, and a series of classical Balinese dance attraction at Garuda Wisnu Kencana Cultural Park Bali - Indonesia. GWK Cultural Park BaAli covers an area of 60 hectare. 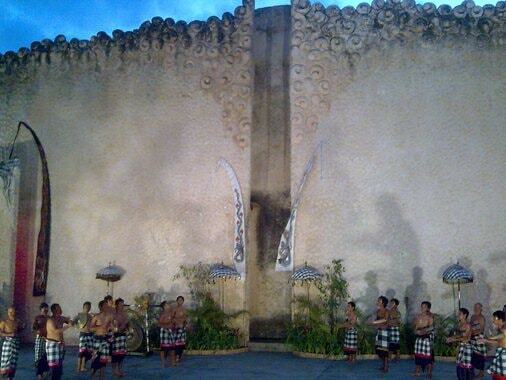 GWK Bali offers a beautiful art work that reflects the heritage values of Indonesia local culture. One of the founders and conceptor behind this magnificent artwork, I Nyoman Nuarta, design the development of the existing limestone hill through a combined land art approach with modern Landscape Architecture. Of course, keep maintaining the sustainability and harmony between people, environment and the almighty god. 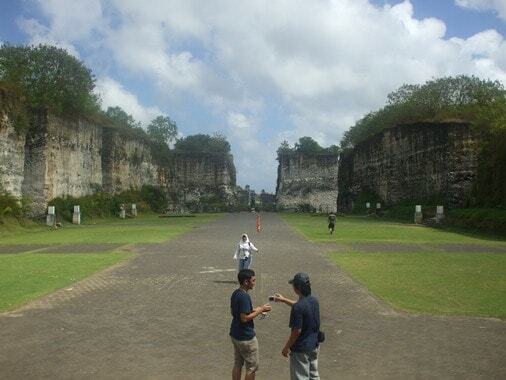 Garuda Wisnu Kencana Cultural Park Bali - Indonesia evolved into a cultural park that includes cultural exhibits, events and entertainment attractions as well as forum of information and cultural communication for local, national, regional and international. In the development process, GWK did not escape of controversy, especially from the religious aspect. This is related to its enormous size will have an impact on the spiritual balance of the island. On the other hand the project was approved because it would be a new tourist attraction and as well as employment opportunities. Segway is an advance vehicle with two wheels, electric powered and uses self-balancing technology. The computer and motors will keep it upright when powered on. This vehicle is an alternative for exploring the challenging and broad area of cultural park GWK Bali. Visitors can enjoy the experience of riding a Segway and explore its capabilities in Lotus Pond Area. This tool uses Gyroscopic Sensors to detect tilting the device while on the move. This tool can reach speeds of 12.5 mph or 20.1 km/h. Just lean forward to go forward, lean back to do opposite and turn by using handlebar. 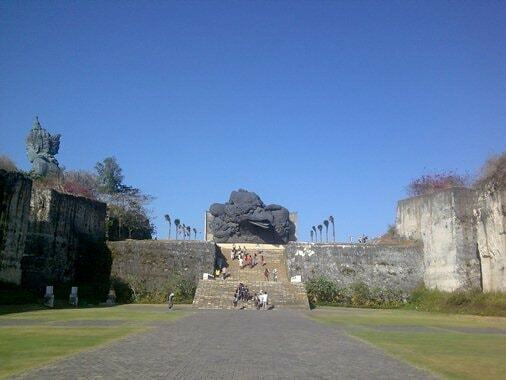 Since laying the first stone in June 1997, the construction phase of GWK Cultural Park experienced ups and downs. 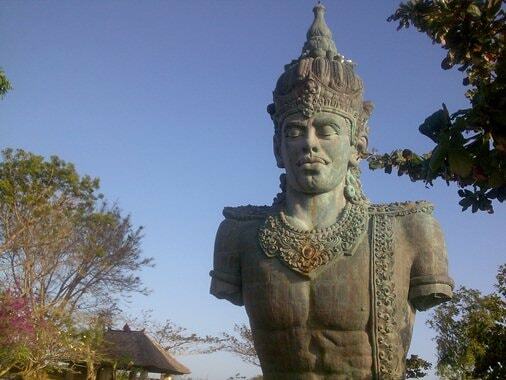 But after 16 years, the project was reworked to finalize the intact statue of GWK Statue Bali. Laying the first stone was held again on August 2013. GWK new statue will be built with the high of 75 meters (246.0 ft.) and wingspan of 64 meters (209.9 ft.). The statue will have a pedestal with the high of 50 meters (164.0 ft.). The previous statue (Vishnu statue with a height of 23 meters or 75.5 ft.) will be left in its original location because it has become part of history. The new statue will be made of copper and brass weighing of 3000 tons. The structure using stainless steel with a 7.5 magnitude earthquake resistance. After completion the monument will has a height of 125 meters (410.1 ft.) and taller than the Statue of Liberty which has a height of 93 meters (305 ft.). Garuda Wisnu Kencana Statue Bali is expected to be a binder of space. This monument will have a visibility of 20 kilometers (12.4 miles) that will be visible from Nusa Dua, Kuta, and Sanur to Tanah Lot. The "Kencana" word itself refers to a layer of gold used for several important parts include crown used by Lord Vishnu and the Garuda. At the base of the statue was planned as multi functional facilities such as ballroom for an international conference and a few galleries to showcase artistic creation and culture of Indonesia. Garuda Wisnu Kencana is inspired by the Mahabharata Epic which tells the life of the mighty bird Garuda up to becoming a mounts of Vishnu. The story begins of a wise man named Rsi Kashyapa. The sage has two beloved wives, Kadru and Vinata. Both have been blessed with children. Kadru is the mother of the snakes and Vinata is the mother of Garuda. One day, Kadru and Vinata bet on the color of Ucaihsrawa, the tail of a celestial horse that fly in the sky. Vinata said the color is definitely white, while Kadru said the celestial horse has a black tail. Both agreed that the loser would serve the winner for lifetime. After arriving at home, Kadru ordered her sons (the snakes) to look for the horses during the night and their snake bodies have to attached firmly into the horse's tail so it would seemingly be black. The next day Kadru and Vinata back to observe the celestial horse's tail. After seeing the black colored tail, Vinata admit the defeat and accept the agreement to serve Kadru for lifetime. To free his mother from slavery conducted by Kadru and the snakes, Garuda need to follow Kadru orders to get Amertha, the holy water of immortality. The Amertha is very closely guarded in the Kingdom of Indra. Garuda finally flew to the kingdom of Indra. Arriving in the kingdom, Garuda attacked by the guards and fierce fighting occurred. Garuda finally win and get the Amertha. Garuda can just drink it and become eternal but he prefers to save his mother from slavery of Kardu and the snake. Garuda then handed the Amertha to the snakes and finally succeeded in freeing Vinata. Knowing this, God Vishnu was impressed and confers immortality to Garuda without drinking the Amertha. Furthermore, Lord Vishnu asked him to prevent the snakes drank the Amertha. Elsewhere, Indra decided to attack the Garuda and reclaim the Amertha. The fight ensued, but the defeat was in the Indra. Garuda promised to restore the Amerta to the gods. At that time, just as the snake to drink Amertha, the god Indra managed to seize it. But a few drops of Amertha spilled and licked by the snakes. Unfortunately this makes their tongues split in two. Selfless Devotion and sacrifice of Garuda to freeing his mother makes God Vishnu amazed and made Garuda the king of all birds. Garuda also agreed to become a mounts of God Vishnu. Since that time Lord Vishnu is always accompanied by Garuda. Garuda eventually became an ally of the Gods. GWK Cultural Park offers a magnificent masterpiece that reflects the heritage values of local culture of Indonesia. Take your time to travel to GWK Bali, hopefully helpful and thank you!